I’d read a few stories in the news about how Glasgow’s Queen Street Station was going to be demolished and improved by rebuilding, but to be honest, I hadn’t realised the demolition was going to be as extensive as I recently found it to be. In terms of building life, I seem to recall tripping over some old pics of the station dating from around 1970 or so, and it looked to me as if some fairly extensive clearing had been done back then, to make way for new build. As seen from George Square, the demolition is being carried out all the way from the internal works of the station, all the way up to West George Street and the Square. I spotted a nice ‘Arty’ view of the scene, with one of the statues looking on. Then wasted when I failed to spot the arm overlapping the pole. Just a little further to the side and it would have been so much better, with the statue standing in isolation. 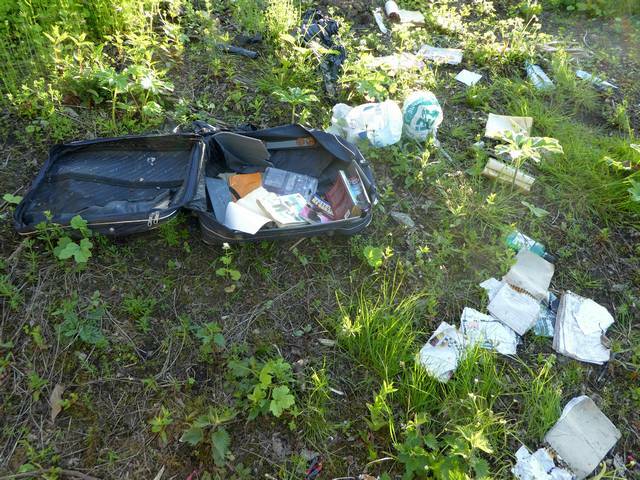 Remember the (presumably stolen) suitcase I came across on the banks of the Clyde last week? I was along the same path this week, and guess what? Someone took an intense dislike to the case and stuff still inside, and set fire to it. You should be able to recognise the spot, but there’s no case there now, just some charred remains. Funny thing – they left all the books and papers scattered around the spot untouched. They might have taken the time to throw them on the fire and at least tidy the spot up a little. One good thing – I found a nice new ballpoint pen there this time. Since I’m not usually neat the new Polmadie Footbridge during the working day, getting the chance of a detour early in the day seemed an opportunity not to be missed, and it was indeed worth the effort. When I got there, I found that work was indeed underway, and there were a number of interesting things to see. From a distance, the most obvious change to the usual (deserted) evening view was the presence of a spotter in a boat stationed beneath the bridge works, presumably ready to spring into action the moment one of the workers falls into the river. A serious consideration, since those working on the bridge seem to so loaded with protective clothing, harnesses, tools, and who knows what else, that they would actually be in serious trouble within moments of landing in the water. This look at couple of the workers shows they are far from being ‘under dressed’ and would soon be waterlogged if they landed in the water (and I’m pretty sure that even on the nicest of days, the River Clyde is probably far from being anything like warm). Given the work environment, it’s safe to assume they’re wearing steel toecap work boots too. They are also wearing Personal Flotation Devices, which should inflate automatically when wet. Look like BIG nuts and bolts have gone the same way as massive rivets for bridge construction, and this deck structure is being welded. Seems nobody noticed as he floated away down river, and it was only the bump as he passed over the tidal weir that meant he didn’t drift out to sea, and was never seen again. Recall the fire I mentioned seeing the after effects of in Shettleston, almost exactly a year ago. I’m not sure why (maybe something to do with insurance or suchlike), but despite all the land surrounding the remains being cleared and levelled (and currently now having flats built on it), these remains were left alone and untouched while the work went on around them. I gave up having a specific look to see if this corner was cleared, as it began to look as if it was never going to happen. Then, last night, I glanced over (expecting to see the remains as usual) and, there they were – GONE! I had been watching more regularly from the street behind, but as you can see, the new build going on there has reached a height that screens this corner from view, so I’m not sure when this little piece of demolition and clearance actually took place. 31 May is No Tobacco Day. I make no apologies for endorsing this day fully and without reservation. I can think of at least three close family members who were killed by tobacco, or had their later life ruined by the after-effects of smoking for years. I also give thanks for my own luck, being surrounded by smokers, yet finding it to be a disgusting habit that I simply could not understand their enthusiasm for. Having tried it to see what the great attraction was, I was completely mystified, and never had any desire to try again. Even now, every day we see people standing outside in the rain huddled over a burning stick of foul tobacco. The stench gets into their clothes, stains their teeth, and permeates the surrounding air. Every moment of every day is spent longing for that next nicotine break to feed their obsession. No Tobacco Day is dedicated to those who are determined to leave this foul substance behind them, and encourage others to do so as well. No Tobacco Day was established with the goal of raising awareness of the dangers of this habit, and the thousands of lives it costs every year. Tobacco used to be considered an innocuous little treat for the civilized, and even went so far as to be touted as healthy by business and well paid off doctors to help promote it for use. A hundred years and millions of deaths later it’s become undeniable that tobacco use is one of the primary killers of people all over the world. Camel was probably among the worst of the liars as regards ‘healthy’ tobacco, with many adverts in print and on the radio of the day which promoted the health benefits of smoking, and made a virtue of how ‘their’ cigarettes did not cause throat problems. So if you’re one of the millions of people who light up a cigarette, step out for a cancer stick, or have a smoke, then let No Tobacco Day be your chance for a freer, healthier future. The average smoker spends around £3,000 a year on cigarettes, imagine what you could do with that kind of money! That’s enough for a nice cruise in the Caribbean, a powerful new gaming computer, or an entire wardrobe of amazing clothes! No Tobacco Day can be your step towards economic freedom as well! Start off by setting aside your cigarettes, and starting the day out with a fresh new perspective that’s tobacco free. OK, that isn’t realistic, so at least start No Tobacco Day by counting the number of cigarettes you smoke in a day, and setting yourself a goal for a gradual reduction in cigarettes until you’re absolutely tobacco free on the next No Tobacco Day! Over the following year you’ll start to feel healthier, have more energy, get sick less, and have more money in your pocket! Consider it a first step to kicking that nasty tobacco habit. You might also want to consider asking those who think smoking is some sort of ‘Right’ to explain how their ‘Right’ to light up and fill a room with stinking poisonous smoke affects the ‘Right’ of others in that room not to be immersed and steeped in that smoke. There’s not really much difference between someone smoking in an enclosed room, and someone coming in and blowing asbestos fibres around. But since smoking has been ‘kewl’ and socially acceptable for the years the tobacco companies lied and suppressed the research that showed smoking caused cancers, smoking is somehow acceptable to some in a way that spreading asbestos dust is not. Although I was able to visit quite a few of the abandoned ROC (Royal Observer Corps) Nuclear Monitoring Posts left around Scotland some years ago, I didn’t manage to loop around all those in the Borders, and couldn’t recognise this one featured in a news story about it being offered for sale. A bit of digging confirmed this, as it is the post located near Traquair. Bought by an art and antiques dealer back in 2003, he’s gone off to the Philippines, so no longer needs the potential ‘holiday home’, and placed it on the market… for £20,000. I’ve no idea how that relates to prices for the posts nowadays, but when I was flitting from post to post somewhere around the turn of the millennium, those who chose to speak to me hinted (they wouldn’t give the actual figure) that they had parted with somewhere between £3.5 k to £5 k.
Given I knew them, and their circumstances, that was believable, and none of them could have afforded to splash out £20 k on a whim. When the Traquair post was sold back in 2003, it had previously been purchased by a telecoms company. Such companies had bought quite a few theses posts, not for the posts, but for the location/site, which was often in a good locations for a mobile phone mast. Such masts can now be found near quite a few of the abandoned posts. See also the site record: Traquair, Peebles. Australia really does seem to have ‘Lost the plot’ when it comes to cats, and claims that it can’t deal with them by means that don’t involve killing them all, and justifies its approach by claiming that they’re killing everything. Funny that other countries can manage a bit of co-existence and control. I wonder if they took advice from SCROTUS – and made the cats pay for it! There seems to be a problem with the claim though. Rather than being a single, properly peer-reviewed and independent study, it seems to cleverly combine a number of other studies to arrive at a final ESTIMATE for its numbers. Reminds me of the claim that thousands of birds are being killed by wind turbines – while it turns out that there’s probably only one or two, but they’ve been watched thousands of times on YouTube. I think it’s now around 75 years old, and VIC32 continues to sail around Scotland. During World War II, the Admiralty was mindful of the puffers’ contribution, and commissioned a similar craft to service the fleet with supplies from its victualling yards, and weapons from its munitions depots. These were known as Victualling Inshore Craft, or VIC boats. The Clyde puffer was ideally suited to the job, and provided the Admiralty with the craft it needed, and required few changes from the original design to meet its needs. While they adhered to the overall puffer design, the original clipper stern was complex and hard to build, so the Admiralty developed a simpler hard chine design which also allowed more room for the Master’s cabin. Most of the VIC boats were built in England, with many coming from the Doncaster area. A number of boats were fitted with water tanks in lieu of a hold, and were used to carry fresh or distilled water to ships at anchor. In addition to their service at local British naval establishments, a number of these boats were shipped overseas as deck cargo, and operated in locations such as Malta and the Far East. There’s more on this in our Wiki page on Clyde Puffers. I usually just get to see other people’s pic of the puffer as it tours around the coast, and canals, but this chance find means I get my own pic. This is at Pacific Quay, with the Science Centre just visible to the left, and the IMAX theatre behind. Not the best view, but I’d have had to fly or swim for anything better – and neither of them is happening any time soon, for me at least. I’d been a bit irritated/disappointed at not being able to get back for a look at the Glasgow School of Art since I grabbed some pics after the fire back in 2014, I always seem to be nearby, but not quite there. Although I hadn’t planned being there last week, when I ended up nearby I decided that no matter the hassle, I was going to have a look. I’m not sure what I expected, but the ‘good news’ was that the place is still so shrouded in scaffolding, and hidden behind Portakabins, that there isn’t really much to see from the outside. While I don’t think there’s been much mention of the work going on there recently, it has featured in the news whenever any significant developments arise, or work gets underway, such as the creation of development models which have been used to plan restoration, and the awarding of contracts. The Glasgow School of Art has, for all my life, been what is now referred to as the Mackintosh Building, and at the moment, that matters, since the Mackintosh Building is closed to visitors while restoration work is undertaken, but the Glasgow School of Art now included a modern building complete across the road from this, and completed just about the same time as the fire, so the new building was able to take over many of the duties performed in the old building. I’ll just have to try to learn to ‘Get it Right’. This is the Mackintosh Building being restored. I look at most of around my neighbourhood for changes, and also for interesting features. This can pay off since many were built around the turn of the 20th century, and Victorian villas and mansions can have odd little bits and pieces hidden away in corners. This can bring the odd (very odd) surprise sometimes – as in this head I noticed stuck onto the front of one such building. This has to be new as I simply can’t believe I’ve wandered this street for years and not noticed it before. Alarming thoughts of ‘Hammer’ films come to mind, as I wonder who would mount a large stone representation of Lucifer on the front of their house. Hammer films liked to have secret satanic societies in their plots, while they claimed to be secret societies, they also seemed to have plenty of public signal betraying their presence, presumably to keep the locals in their place. Where did the ‘creepy coincidence’ reference come from? And this was amongst the first sketches I saw that night, entitled ‘Lucifer’. 29 May is Biscuit Day. So, argue there if feel the need. Regardless, I will continue to enjoy my chocolate digestive biscuits, and chocolate chip cookies. And walking past ‘The Biscuit Factory’ in Parkhead (McVities), where a great smell drifts from, especially if the wind is in the right direction. The odd visit there was nice too, since I got to the factory shop where the staff could buy big bags of ‘broken biscuits’.